Last weekend we spent more than few hours on a really exciting event. Bucharest international AIR SHOW & General Aviation Exhibition was held on Baneasa Aurel Vlaicu international airport in Bucharest to celebrate 100 years of aviation history in Romania. 100 years since Aurel Vlaicu first presented acrobatic figures to the audience to amuse them. Considering Tautis is Lithuanian he cold not miss such an opportunity to watch performance of one of Lithuanian biggest starts Jurgis Kairys. Over thirty years from 1970's this acrobatic pilot is polishing his style and honing his skill. Winner of the first Red Bull Airrace in 2003, multiple Freestyle World Acrobatic Champion and inventor of many acrobatic tricks - Cobra, Slide pass, Kairys Wheel, Kairys is leading the international acrobatic team, the AIR BANDITS. Apart from the show, whole space of Baneasa Aurel Vlaicu international airport was filled with exhibition of different aircrafts. You could touch famous smell the interior of luxury helicopter and hear the roar of veteran Jag. Or you could try to sit in the In addition, there was all day discotheque. DJ were playing music in between the show events so people could enjoy their stay and savour draft beer and traditional mici with mustard and bread. its a shame that on Sunday there were almost no stalls(10 in total) with draft beer left. At 12 o'clock no beer at all!!! Most spectacular, however, were the Turkish stars and Frecce Tricolori. On Saturday I came just in time to spot the acrobatic flips and loops of Turkish stars. Red and white NF-5A and NF-5B aircrafts. There were 8 or more aircrafts in the air and supersonic boom was giving me the chills. I have never seen aircrafts approaching each other so close in supersonic speeds. The pilots could literary watch their comrades dashboards. Considering their speed was over 1,200 km/h those guys have to be crazy. Performing more than 20 tricks, the Turkish stars dominated the afternoon sky with their eagle looking aircrafts. Formed in 1961 Frecce tricolori are known as a team with the highest number of aircrafts in their acrobatic team in the World. They operate The Aermacchi MB-339-A/PAN subsonic jet trainers and amaze the audience all over the world with their Green/White/Red show. For Frecce tricolori year 2012 is also a milestone. Together with the Romanian anniversary they are celebrating 30 years of teaming up with their aircrafts. Name of their captain Fabio Capodanno was declined countless times during their Sunday's final exhibition. "9 aircrafts in formation with one solo pilot performing the most dangerous feats taking the breath of ten-thousand headed crowd underneath them." But it were not the tricks they performed, nor the beautiful weather they had for their performance rather the voice of the commentator that made the SHOW! His accent and passion whit which he described all the acrobatic feats of his comrades along with the wast pieces of interesting information he lavished the audience with - simply amazing. I enjoyed this particular part of the event the most. Might bee due to the 4th beer on the sun:-) Still one of the most ecstatic experience here in Romania. Saturday afternoon belonged to the Romanian air club - Aeroclubul Romaniei. From aircrafts, helicopters and gliders to parachutes, we were witnessing incredible twilight show. 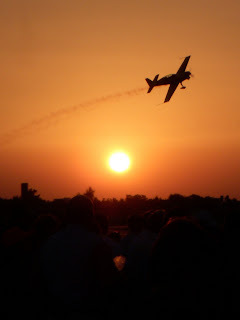 Perfectly timed with no delay the performers reign the sky above Baneasa Aurel Vlaicu International Airport and there were feats to admire. Synchronized parachutes, Skydivers, Helicopters operated so precisely they could stop on the top of a pin and amazing Hawks of Romania. This group formed in 2007 won International Acrobatic Contest in Hungary this year and their Extra 300L aircrafts has something to show. From loops, twists and flyovers they transited to shooting the air balloons directly with their planes above our heads. Spectacular indeed.